By August 1950, Israel had found temporary solutions to some of its fuel supply problems. However, the reopening of the Haifa refinery and the continued functioning of the three distributing companies had been effected without the creation of a fully agreed legal foundation to replace the arrangements of the Mandatory era. While such a situation seemed only natural in the months immediately after the 1948 War, the fact that — in strict legal terms — it did not really change until Israel became totally independent of these companies half a decade later requires an explanation which the present chapter will attempt to provide. 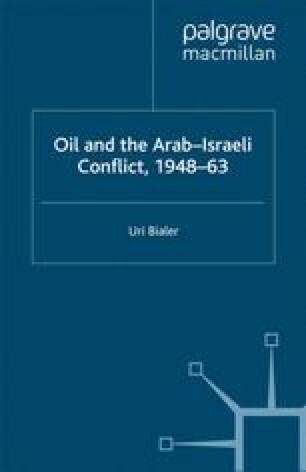 The analysis below will present the perspectives of the British oil companies on the one hand and of Israel on the other in the negotiations which were held in the early 1950s, and that did not culminate in an agreement. The account will clarify, in particular, Israel’s constraints in translating its sovereignty into independence in the area of oil supply. At the same time, however, it will also sketch the background to Israel’s decreasing dependence on British and American companies, its temporary reliance on Soviet oil supply and finally, the opening up of the Iranian market which was to become its principal source of fuel provision for many years.